Like all good Latter-day Saints of my generation, I’ve always been a committed polygamist. To be clear, I’ve never been a practicing polygamist. You could say I’m a polygamist in the same sense that I’m a nutritionist. I know nutrition is out there, I’m told it’s good for me, and I always figured that one day I would probably get around to practicing good nutrition. That’s kind of how I’ve thought about polygamy most of my life. It was out there in the future somewhere, but not necessarily all that relevant to me at the moment. Those of you new to the church in the last couple of decades may be surprised to learn that when we old timers were growing up, we were taught that “someday they’ll bring back polygamy” and at that day the faithful among us would finally jump back into the pool. Plural marriage is, after all, an eternal principle, the suspension of which, we were frequently told, was only temporary. 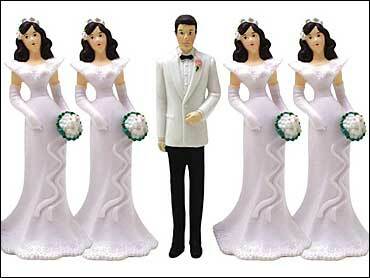 When I was a young single man, my attitude toward polygamy was somewhat ambivalent. What did I care whether I ended up with one wife or seventy, just as long as I got to do it with somebody. Just gimme that first wedding night and we can discuss numbers later. So while growing up, whenever someone spoke up in Sunday School or Seminary with the reminder that someday we would all be required to practice “The Principle,” I was okay with it. Sure. Fine. Whatever. Then one day I met my soul mate. Few men actually have the good fortune to meet and marry their actual soul mate the first time out. Some guys find her eventually, but it often takes a second marriage, or a third. Most never do. I hit pay dirt the first time out. I knew Connie was The One the moment I saw her; I recognized her from my dreams. I've known from the beginning that after finding her there was no possibility of my ever wanting to take on any additional wives. Just not gonna happen. Ever. Connie is my one and only, my kindred spirit. We're one couple, indivisible. And we ain’t sharin’ our bed with nobody else. Luckily for us, we’ll never have to, because I’m happy to announce that while I’m firmly devoted to most of the tenets of the Church of Jesus Christ of Latter-day Saints, I no longer believe in the doctrine of plural marriage. I'll bet you don’t really believe in it either; not enough to start living it right now if you were told to. As for me, I’ve had a real paradigm shift in my thinking, and it came to me after reading a book by Richard and Pamela Price entitled Joseph Smith Fought Polygamy: How Men Nearest the Prophet Attached Polygamy to His Name in Order to Justify Their Own Polygamous Crimes. Yeah, I know. Stay with me here. I own Todd Compton’s book, In Sacred Loneliness: The Plural Wives of Joseph Smith, wherein he traces the lives of the estimated 33 women who are believed to have been secretly married to Joseph Smith at Nauvoo. There may have been some disagreement among scholars about the exact number of wives the Prophet had, but surely no one doubts the basic story. We all know Joseph kept the practice secret so as not to give his enemies cause and to mollify his jealous first wife, Emma. But to suggest that Joseph Smith may have actually fought against the doctrine of plural marriage was, to me, an absurd supposition. It was not even worth thinking about. Those are some pretty strong words coming from a guy who is supposedly getting a little on the side. They leave no room for equivocation. Joseph Smith was unmistakably condemning to hell any man who advocated polygamy, even if that man was the prophet himself. Who's Putting Words In Joseph Smith's Mouth? It is not commonly known that the seven volume History of the Church, which purports to have been written by Joseph Smith himself, was substantially added to and edited after the Prophet’s death. After all, Joseph Smith did leave great gaps in the narrative, and if his history was to be complete, the account required additional input from subsequent church historians. Editions of the massive work were still being tweaked by B.H. Roberts as late as 1912. This is not editing for clarification. This is prevarication, a lie; a calculated attempt to change church history. I felt it was high time I found out for myself what Joseph Smith had actually said about plural marriage in his own words, so I ordered a copy of Joseph Smith Fought Polygamy from RestorationBookStore.org and read it through. I admit to approaching the book with skepticism. I consider myself pretty well read in the history of the Missouri-Nauvoo period, so I figured I’d spot the flaws in this thesis right off the bat. But the startling conclusion I came to is that most historians, both Mormon and non-Mormon, who have taught that Joseph Smith was a secret polygamist, were proceeding from a false assumption. Several false assumptions, actually; not the least of which was that the many women who claimed to have been Joseph Smith’s plural wives had no reason to lie. The truth is the precise opposite. They had some very good reasons to lie. You have probably never heard of the Cochranites, because this odd religious community simply vanished from history sometime in the late 1830's. While they were on the scene, though, they stirred up quite a fuss and enjoyed no small amount of notoriety. Richard and Pamela Price, the husband and wife authors of Joseph Smith Fought Polygamy reproduce several articles from books and newspapers of the era that tell of the charismatic leader Jacob Cochran, who convinced some two thousand supporters that what he called “the Patriarchal Order” -that is, polygamy- as practiced by Father Abraham, was the proper mode of marriage, and that this “spiritual wifery” was ordained of God. By the time of Jacob Cochrane’s death in 1829, there were still upwards of a thousand dedicated polygamists in the movement he founded, and they settled themselves up and down the borders of Maine and Massachusetts, with the main body in Saco, Maine. When the first Mormon missionaries arrived in the area in 1832, they found the Cochranites to be extremely receptive to the message of the Restoration. Accustomed as they already were to following in the traditions of the ancient patriarchs, it was not difficult for them to accept the message that the ancient church of Christ had been restored with all its gifts. The missionaries tarried among the Cochranites for several months and won many converts. No doubt during their prolonged interaction with each other, the Cochranites shared their philosophy of plural marriage with the Mormon Elders. The Cochranite stronghold was such a fruitful place for converts that the young Church of Christ held a conference in Saco in 1834. Nine of the twelve apostles were in attendance. Although the Cochranites vanished from the history books by the end of the decade, they hadn’t really disappeared. They had simply been folded into Mormonism, selling their farms and shops and moving to Kirtland and eventually Nauvoo, bringing their polygamous families and teachings with them. If you turn to section 101 in your D&C today, you won’t find that passage. It was removed when the Doctrine and Covenants was reprinted in 1876. The Quorums of the Seventy at Kirtland also made it known that polygamists would not be tolerated within that body when they adopted a resolution which stated that they would have no fellowship with any Elder "who is guilty of polygamy." Joseph Smith’s denunciations of polygamy were frequent and fervent. He considered the practice a plague that must be stamped out or it would eventually lead the church to the very brink of destruction. But even he was not prepared to learn that some of his best friends were seducing women by claiming the authority to do so came from him. It’s not unusual for many of us today to assume that when the church was young, Joseph Smith knew everyone in town and everyone knew him. But this wasn’t true. Some members lived their entire lives without having personally met the Prophet. Thus it was with a young lady by the name of Sarah Miller who was a member of the choir during one of Brother Joseph’s sermons condemning polygamy. Higbee duped the innocent girl into believing that she was Higbee's “spiritual wife,” and that in time they would be married. Several other women soon came forward telling similar tales. It turned out that Chauncey Higbee, his brother Francis, and several others were having their way with many women using the line that Joseph Smith sanctioned such seductions. As these women came forth to the Nauvoo High Council with their affidavits, a common thread emerged that astonished even the Prophet himself. It seems that if any of these men encountered resistance to the claim that Joseph Smith approved of their actions, they merely took the young lady to see the second most prominent citizen in Nauvoo, and he would assure them that yes, it was alright, Joseph Smith says so. This unethical cad was seducing many women himself by telling them that Joseph Smith had received a revelation which allowed men to have plural wives. I’ve long felt that if ever there was a Mormon whose life story would make a fascinating movie, John C. Bennett was that guy. But the movie would have a very, very bad ending. It’s very likely that Nauvoo never would have become the impressive city it was had it not been for the able assistance of Dr. Bennett. Bennett arrived among the Saints precisely when he was needed most, just after the Saints had been expelled from Missouri and were now gathering weak, sick, and destitute on the Illinois side of the river. He appeared like a knight on a white horse, and Joseph Smith was grateful and relieved to be offered assistance from such a capable personage as the well appointed Dr. Bennett. The grateful citizens of the city he built elected John C. Bennett their first mayor of Nauvoo. Bennett’s credentials were impressive. In addition to being a medical doctor, Bennett had also been a brigadier general, a quartermaster general, the dean of one university and the president of another, a horticulturalist, a postmaster general, a preacher, and an attorney. And now he was the mayor of the fastest growing city on the Mississippi. If anyone had shown up on the scene today with a resume like that, he would instantly be pegged as a fraud and an impostor, which, it turned out, Bennett was. But Bennett was brilliant and capable, and he actually knew his stuff, so no one in Nauvoo thought to question the handsome savior who had appeared in their hour of need. Nauvoo grew prosperous and impressive under Bennett’s rule. He became easily the most prominent citizen of the city next to the prophet Joseph Smith himself. Bennett lodged with the Smiths and became fast friends with the prophet, and when Sidney Rigdon took ill, Joseph even made Bennett First Counselor in the First Presidency of the church. When it was revealed that Bennett had been using Joseph's good name in order that he and his friends could bed unsuspecting Mormon women, Joseph quietly conducted an investigation. He sent Bishop George Miller to Ohio to look into the good doctor’s background. Miller reported that Bennett had lived in twenty towns in as many years, that he “has the vanity to believe he is the smartest man in the nation; and if he cannot at once be placed at the head of the heap, he soon seeks a situation...always push[ing] himself into places and situations entirely beyond his abilities...and the next thing his friends hear of him he is off in another direction.” Joseph Smith was coming to the realization that his “friend” had cleverly maneuvered himself into positions of importance at Nauvoo for one purpose: he was building himself a personal empire. Bishop Miller reported one more thing. John C. Bennett, the most popular and eligible bachelor in Nauvoo, had a wife and children whom he had abandoned back in Ohio. When Joseph confronted Bennett with the evidence of his crimes, Bennett wept and blubbered and promised to repent, begging the council not to make his sins public, for fear of how such news would affect his poor mother. But it wasn’t his mother that Bennett was concerned about, it was the damage that exposure would mean for his broader political ambitions. Mercy may have ultimately been Joseph Smith’s undoing, for he agreed that as long as Bennett was sincerely repentant, he would not make public his sins. Joseph made similar agreements with the Higbee brothers when they wept and blubbered and begged. But poor Doctor Bennett just couldn’t keep his breeches buttoned. When it was discovered weeks later that Bennett was continuing his illicit activities, Joseph Smith preached a public sermon against Bennett and his false teachings. That was the end of it for John Cook Bennett. He was finished, and so, he knew, was any chance to be elected to the Illionois state legislature, a position he desired very much, and for which he had no hope of attaining without the support of the Mormons. General Bennett was cashiered out of the Nauvoo Legion and expelled from the Masonic Lodge he himself had founded. He was also expelled from the church. He left town in disgrace, but he vowed that neither Joseph Smith nor the citizens of Nauoo had heard the last of him. He would get his revenge against them all. Bennett ended up in Carthage where he began to write a series of letters that were printed in newspapers far and wide “exposing” Joseph Smith as a polygamist and charging him with seduction, murder, treason, and other crimes. A few months later Bennett published a book entitled The History of the Saints; or, an Expose of Joe Smith and Mormonism. It was largely the inflammatory charges contained in those letters and that book that got the non-Mormon populace so riled up against Joseph Smith that in the end some were even willing to murder him. As Doctor Robert D. Foster said of Bennett, “He tried to father all his own iniquity upon Joseph Smith.” Ironically, many of the things faithful Mormons today believe about Joseph Smith concerning polygamy can be traced to the ugly lies originally promoted by the vindictive Dr. Bennett. Although John Bennett gave Joseph Smith no end of grief, he was by no means the only person close to the Prophet discovered to be practicing plural marriage. Joseph continued in his resolve to stamp out the spreading plague. The group that included Bennett and the Higbees and their “spiritual wives” proved to be only part of the problem. The philosophy of the patriarchal order introduced to the church through the Cochranites proved very appealing to many of the Saints, with the result that even some within the Quorum of the Twelve had come to believe in it and were secretly taking additional wives. Joseph told William Marks that he intended to expose and root out this disease from even his closest associates. But the Prophet never accomplished the task, because three weeks later he was dead. It is a common belief within the church that Joseph Smith died defending his testimony of the Book of Mormon. While that impressive work was clearly the crowning achievement of his short life, he left no recorded evidence that the Book of Mormon was foremost on his mind either on the eve of his death or in the weeks leading up to it. If you’re looking for a truly fiery testimony from Joseph Smith just prior to his martyrdom, you’ll find it in his vigorous defense of his singular marriage to Emma and his castigation of those advocating polygamous unions, as well as his vehement denunciation of those accusing him of impropriety. The book is filled with examples of Joseph Smith decrying the practice in his many sermons, as well as numerous newspaper articles and affidavits by those close to the Prophet disproving the charges against him. You can read the entire book online here, as well as the yet unpublished volume two. I highly recommend, however, that you buy yourself a hard copy of the book, because it contains sketches, photos, and copies of documents vital to a full appreciation for the thirty years of research the Prices' put into this effort. So what about Section 132? Isn’t that a revelation in Joseph Smith’s own hand calling for the institution of plural marriage? Well, no it isn’t. That is, the revelation does clearly call for plural marriage, but it isn’t in Joseph Smith’s hand. And no one had ever heard of it during Joseph Smith’s lifetime. It showed up as if by magic eight years after his death. After the martyrdom of Joseph and Hyrum, the Nauvoo Temple was eventually finished, and some were soon putting it to use performing secret ceremonies wherein men were being sealed to multiple wives. This was a purpose for which the first and only other Mormon temple, the one at Kirtland, had never been used. “All marriages in this church of Christ of Latter Day Saints,” the declaration stated, “should be solemnized in a public meeting, or feast, prepared for this purpose..."
You can read the entire rule here in the church newspaper, the Times and Seasons where you’ll see that “the above rule is the only one practiced in this church,” and that the words of the ceremony leave no room to suppose that it was ever intended that another spouse join the marriage at any future time. So eight years after Joseph’s death, at a special conference called for the purpose, President Brigham Young (a polygamist) asked Apostle Orson Pratt (now also a polygamist) to read aloud a document purporting to be a revelation from the Lord to Joseph Smith, later to be incorporated into the Doctrine and Covenants as section 132. The document revealed that plural marriage was not merely approved by the Lord, but now actually required for any good Latter-day Saint man or woman not wishing to be damned. Brigham explained that this revelation of Joseph's, which Brigham called “the New and Everlasting Covenant” had been kept locked in a drawer in his desk all this time, but he didn’t explain why it hadn’t been released sooner. Joseph Smith had been publicly declaiming against the very things contained within it for a year after it was reported to have been received. Why would any prophet withhold a revelation that came directly from God? Surely any information the Lord sees fit to reveal to His people would be intended for immediate dissemination. More curious yet, this revelation is purported to have been given in July of 1843, just three months before Joseph, as both Prophet and Mayor, angrily took to the streets of Nauvoo and threatened to prosecute any who were “preaching, teaching, or practicing the doctrine of plurality of wives” and further warning all citizens that they are forbidden from engaging in it. In order to accept that Joseph Smith would engage in an impromptu tirade like this after having received such a revelation, you would have to believe that he was not just an outrageous, overwrought liar; you’d have to believe he was completely insane. This “copy” of a very lengthy revelation was in the handwriting of William Clayton, formerly a scribe of Joseph Smith. He was also now a polygamist. What I wonder about is this: was it the practice of Joseph Smith to have his scribes immediately create a second copy of all of his revelations, or did Brigham Young simply ask Clayton to “recreate” this one from memory? So how is it that today we know the names of at least thirty-three of Joseph Smith’s alleged wives, when during his lifetime no one seemed to be able to suggest more than a couple of possible ones? After Joseph Smith’s sons were grown, the three of them made the long journey to Utah to challenge the polygamous system and attempt to restore their father’s good name. They met a wall of resistance. Out of nowhere appeared a number of women declaring that they had all been plural wives of Joseph Smith while at Nauvoo. Most prominent of these women was Eliza R. Snow, a well-known woman of letters and now a plural wife of Brigham Young. Eliza claimed to have been married to Joseph on June 29th, 1842, but this would mean she was married to him three months before she had led a thousand women in promoting a petition stating that Joseph Smith was not guilty of polygamy as Dr. Bennett had charged. So was she lying then or was she lying now? Eliza was sitting pretty as the wife of the prominent Governor of the Territory. Certainly she had much to lose if polygamy was exposed as a fraud and Brigham’s empire crumbled. Besides, it’s very likely that most Mormons by then firmly believed in the principle whether it could be proven to have originated with Joseph Smith or not. The Saints felt constantly under attack from the gentiles for their peculiar ways, and didn’t Brigham constantly preach that “lying for the Lord” was not a sin, but the duty of every faithful Latter-day Saint? Curiously, Eliza Snow held the honored seat, at home and in public, at the right hand of Brigham Young. This position of honor was ordinarily reserved only for a man's first wife. How was Eliza Snow able to shunt wife number one out of the way and take her place? What did she know? Or what could she threaten to tell? Nearly all of the other women who claimed to have been married to Joseph Smith at one time were also in polygamous marriages to prominent church leaders. It certainly wouldn’t have taken much to persuade these women to make a public statement in order to protect the society they had struggled so hard to attain. When you examine the statements of these women, you find some of their claims to be a real stretch. To their credit, some of these women went out of their way in their declarations to maintain that their marriage to Joseph had been for eternal purposes only, and that they had never been physically intimate with the Prophet. So I give these ladies props for at least having the decency not to thoroughly besmirch a dead man’s memory. Also, most of these women neglected to sign their names to their declarations, a clever way of protecting themselves from being called up on charges of perjury if the statements were to be challenged in a federal court. As legal affidavits, these documents are worthless. Besides, these women were soon marched through the temple to be sealed to Joseph Smith a second time, in order that their marriages would now be on record. So they weren’t really lying. In their minds they now truly were sealed to the prophet Joseph Smith for time and all eternity. Why Not Simply Admit It Was All A Big Mistake And Move On? Personally, I don’t mind polygamists. In fact, I like all the ones I've met. Over the years I’ve been privileged to have several friends who chose to live that lifestyle, and I say more power to them. The women in these relationships tell me they are happy not only to have the responsibility lifted of being the sole entertainment for their husband, but they enjoy the company of other women in the house with them. I wouldn’t for a moment tell them I disapprove or try to intervene. Why should I? To each his own. Live and let live. Besides, I don’t belong to their church. But I find it curious that the church I do belong to has expressed an unusual disdain for those who practice the religion my religion used to practice. I was intrigued by the reactions of many of my fellow Mormons a while back toward the FLDS polygamists in Texas. Members and leaders alike scrambled to distance the church from what they considered "those wacky fundamentalists." “Those aren’t real Mormons,” I’d often hear people say. Of course, those people say the same about us. I've long wondered why, since Joseph Smith prophesied that the gospel of this church was destined to "fill the whole earth", that we would adopt a practice so repugnant to the earth's other inhabitants that it virtually guaranteed we would never gain any more converts. It seemed to me that if Satan himself ever wanted to bring the momentum of the restoration to a screeching halt, he couldn't have devised a more effective scheme than declaring plural marriage a mandatory program. Growth from outside the church was stagnant for almost a hundred years, from the 1850's to the 1950's, only beginning to pick up steam when David O. Mckay took determined steps to shake off our unsavory reputation. Still, the prospect of the future return of "the principle" still hung in the air like the sword of Damocles. Then one happy day during an interview with Larry King, I saw Gordon B. Hinckley make it clear that we won't be dusting off that doctrine for another go 'round. “As far as we're concerned,” Hinckley said, “it's behind us, a long ways...I condemn it as a practice because I think it's not doctrinal." Well, that’s a relief, and something our womenfolk especially can all be grateful for. Most of us wouldn't wish to be forced to live under that system even if we did still believe in it. Which brings up a question: If the church today rejects polygamy, and since the evidence is undeniable it wasn't actually sanctioned by our founder, why can’t we simply declare it was all just a big, silly mistake, a diversion from the true path that our misguided ancestors trod in error, but that now we’re solidly back on track? I’ll tell you why. It's been said that Mormonism is a religion constantly running from its own history. If we let Joseph Smith off the hook by copping to this blunder, we'll just open a whole 'nother can of worms to contend with. For we would then have to address the matter of a certain missionary of the church in 1834, one of our early apostles, who insisted he was exempt from the scriptural admonishment that missionaries are to travel two by two. Instead he traveled alone, and after the first missionaries had left Maine, he tarried for months on his own as a guest among the Cochranites; lodging in their homes night after night, taking his meals with them, chatting with them by the fire, gradually assimilating the strange religion of his hosts while sharing the message of the Restoration with them. And when he left, he took with him a woman from that community who abandoned her own husband and children to return home with him and become his second plural wife. When John C. Bennett was to be tried before the Nauvoo High Council for spiritual wifery, Bennett asked that this particular apostle accompany him to the hearing and intercede on his behalf. And at the time of Joseph Smith’s death, this apostle was already secretly married to four women living in Nauvoo. Of course, you’ve already guessed the identity of this guy. His name was Brigham Young. Update: For a further exploration of why the testimonies of the women who claimed to be Joseph Smith's plural wives cannot be trusted, see the follow-up piece here.